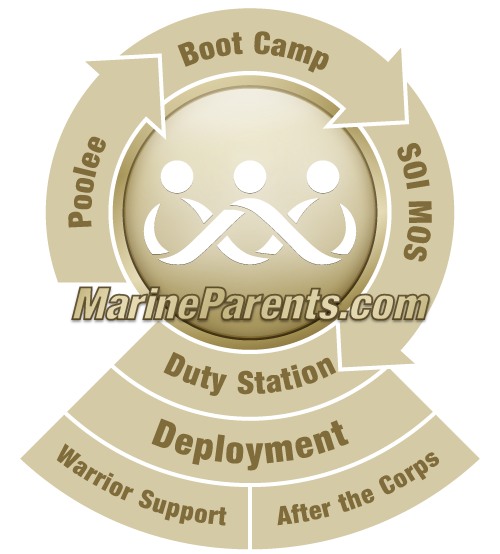 MarineParents.com presents information on the 3rd Marine Division and its bases in the Western Pacific, also known as the "Far East." MarineParents.com presents information on the 3rd Marine Division and its bases in the Western Pacific, also known as the "Far East." The division is divided into the 3rd Marine Regiment at Kaneohe Bay, Hawaii, the 12th Marine Regiment located at Camp Hansen, Okinawa, and the 4th Marine Regiment at Camp Schwab, Okinawa. Additionally, it is further broken down into a Headquarters Battalion at Camp Courtney, Okinawa, and a Combat Assault Battalion and Force Recon Battalion located at Camp Schwab. The division includes elements forward deployed under the Unit Deployment Program (UDP), reporting aboard for six month rotational training cycles. The 3rd Marine Division also has personnel assigned to the 31st Marine Expeditionary Unit (MEU), a "float" in Korea, and on training rotations in Australia. Camp Courtney is one of the few military facilities operated by the Marine Corps in Japan. The base is located on the island of Okinawa—more precisely, in Uruma city. It is one of the "youngest" cities of Japan. Click here to learn more. Camp Foster is a co-base, meaning it is run under the regulations and laws of the Japanese government. The base is large enough to spread over four different civilian communities—Kitanakagusuku, Okinawa, Ginowan, and Chatan. Most of it is located in Ginowan. The base does not function entirely on its own. It is part of a larger complex—Camp Smedley D. Butler—that includes additional facilities. Click here to learn more. This base is part of a larger Marine Corps Base, Camp Butler. Located near the small town of Gotemba, Camp Fuji derives its namesake from the mountain that overshadows it, Mount Fuji. Camp Fuji is over 300 square acres, with 30 acres being dedicated to live fire small arms and crew-served weapon ranges. Most Marines in the Pacific use Camp Fuji for training evolutions at some point in their rotation through the region. Camp Gonsalves is one of the largest military bases run by the U.S. in Japan under the laws of the Japanese government. The base is spread over two villages in Okinawa—Higashi and Kunigami. It covers more than 70 square kilometers. It hosts more than 20 landing areas for helicopters, training sites, firebases, and missile ranges. Click here to learn more. Camp Hansen is located in Kin, on the island of Okinawa, in the immediate vicinity of Kin Bay. Aside from Camp Schwab, it is the northernmost American military installation in Okinawa. Just like nine other installations on the island, this is part of Camp Butler. Click here to learn more. Camp Kinser is part of Camp Butler and is located in the immediate vicinity of Naha Port, a similar installation operated by the US Army. Of all the bases in Okinawa, this is the most important. It stores impressive amounts of ammunitions and spreads over 1,000,000 square feet, and is comprised of parts of multiple civilian communities. Click here to learn more. Located in Chatan Town on the coastline of the Okinawa, Camp Lester has direct contact with the East China Sea. The base is also referred to as Camp Kuwea. It went by this name for approximately three decades, and the local population, as well as or older American military members, still call it that. The base was renamed in memory of Fred Faulkner Lester, one of the heroic Marines who fought during the battle of Okinawa. The camp is better known for hosting a local hospital. The base is located on Okinawa, close to the city of Uruma. It is adjacent to a small native village—Kawasaki. Although it benefits from the most modern and luxurious facilities, the camp is not independent as it is under the jurisdiction of Camp Butler. The base is located in the northern part of Okinawa and is often referred to as "Man Camp." It was named after Albert E. Schwab, a Marine who was posthumously awarded the Medal of Honor for bravery during the battle of Okinawa. Click here to learn more. Camp S.D. Bulter is located in Okinawa and is the mother base for multiple other installations in the Okinawa Islands, including Camps McTureous, Courtney, White Beach, Gonsalves, Kinser, Schwab, Lester, Hansen, Foster, and Shields. Click here to learn more. Located only 10 kilometers away from Port Naha, MCAS Futenma is one of the active installations run by the American military in Japan. The base is also used by United Nations forces and includes a 2.7 kilometer-long runway, multiple barracks, logistical buildings, and administrative facilities. It hosts about 4,000 Marines in addition to civilian contractors, family members, and workers. Click here to learn more. Marine Corps Air Station Iwakuni is situated approximately 600 miles southwest of Tokyo in Yamaguchi Prefecture, Japan. The city is overlooked by mountains and is on the Seto Inland Sea. Its northern part adjoins Otake City in Hiroshima Prefecture. Running from east to west, the Nishiki River is vital to the more than 1.4 million residents in the prefecture, as well as the large number of factories in the area. Click here to learn more. This is one of the military facilities lost by the Japanese forces during the battle of Okinawa. The airport is also referred to as Yomitan. It is located on the western side of the island, in the immediate proximity of the Sobe district of the village of Yomitan. Information from Marines.mil October 6, 2015. There are three types of assignments for Marines in Okinawa as listed below. Additionally, all personnel assigned to the 3rd Marine Division are occasionally tasked with training or support missions that require them to travel to other camps or countries, regardless of their Military Occupational Specialty (MOS). They may be sent to support a humanitarian mission or to provide additional personnel in support of a foreign assistance training mission. The first type of assignment is at a permanent duty station, or PDS, is an assignment to a unit permanently assigned to the 3rd Marine Division in Okinawa, on the Japanese Main Islands (primarily MCAS Iwakuni or Camp Fuji on Honshu), or in South Korea at training sites. There are two types of PDS assignments available to Marines--accompanied and unaccompanied. In the Far East/Western Pacific, unaccompanied tours are quite common. When a Marine is assigned to a "hardship" or "bare" base, he or she will only be assigned for one year, and dependents will not be sponsored. There are two main training sites that fall within this category, one in Japan and one in Korea. Marines assigned to an unaccompanied tour are normally below the rank of Staff Sergeant and are assigned for two years, with the option to volunteer to stay for a third year. Marines at the rank of Sergeant and below are only authorized to bring dependents under special circumstances. If a spouse decides to try to move and live near the base without authorization ("unsponsored"), he or she will be considered as a tourist by the Japanese government. They can only stay legally for up to 90 days and they cannot get a job. Even though the individual is married to a US service member, he or she will not receive any support from the US military, and their Marine will normally not be allowed to live in off-post housing. The dependent can access the base and use his or her military benefits. However, he or she will be at the bottom of the eligibility list for medical care, will not receive any military assistance for legal issues, must meet all Japanese visitor requirements, and will not be able to draw overseas housing allowances or other pay. All pay and benefits will be as if the dependent was still in the US. This is because of legal treaties between the US and Japanese governments. Marines assigned to an accompanied tour are normally Sergeants or above in rank, and will normally be assigned for to their PDS for three years. Their dependents are authorized to travel at the government's expense, and will receive full benefits. The dependents (especially spouses) are eligible for hiring preference with US government organizations. The second type of assignment a Marine may receive is to the 31st Marine Expeditionary Unit (31st MEU). Some personnel are assigned on PDS to this unit, but the majority of the personnel who go on "floats" with the 31st will be assigned to a unit on the US mainland or Hawaii. These personnel will travel to Okinawa, train in preparation for the float, and leave Okinawa to go on the MEU before returning stateside or to Hawaii. The final type of normal assignment for Marines to Japan is the Unit Deployment Program (UDP). The Unit Deployment Program was setup to reduce the number of personnel permanently assigned overseas while still allowing for complete manning of assigned missions. The program takes a unit and forward-deploys them with other units that are permanently assigned to an overseas base. In other words, an overseas infantry regiment would have two of three battalions permanently assigned and one battalion would be placed on UDP from stateside to bring the regiment to three battalion strength. *This page was written by MarineParents.com Volunteer, Jeff James, Father of a Marine.